In June 2012, Brian Smith, a construction equipment broker, scouted out the Capitol Square Apartment site in Arlington to see if they could use his services. The contractor’s crew was there removing asbestos, and Brian gave them his card in hopes that they would contact him for their construction equipment needs. They did not, and Brian, a 7 time marathon runner who was happily settled near the water in South Boston, never imagined he’d be living at Capitol Square Apartments nine months later in an accessible unit, confined to a wheelchair. Housing Corporation of Arlington’s latest affordable housing development, Capitol Square Apartments, has two fully accessible units with an exterior ramp and an interior lift for those with mobility impairments. Last August, Brian jumped off a 30 foot boat in Lake Winnipesaukee in New Hampshire, hitting the sandbar and breaking his neck. Brian was sent by helicopter to the Dartmouth–Hitchcock Medical Center. Both his legs and arms were affected by the accident, and he became quadriplegic. After a five‐week drug‐induced coma, Brian found himself at Spaulding Rehabilitation Hospital for three months. As Brian worked hard on his recovery, he tried to figure out how he was going to live safely and independently. Brian’s South Boston apartment was not wheelchair accessible. With the help of his father, brother and a case worker at Spaulding, Brian “applied everywhere.” One place he applied was the Capitol Square Apartments and was luckily the 13th number picked out of 333 applicants in the lottery. 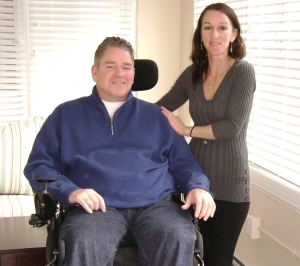 At the end of February, one month later, Brian was offered an accessible unit in Arlington. The unit is bright and cheerful with automatic door openers, an accessible bathroom and doorways wide enough for Brian’s wheelchair. For someone who used to get up at 4:00 AM and be knocking on doors by 6:00 AM, the change in lifestyle has been monumental. Brian used to participate in 30 races each summer—5Ks, 10Ks, and half marathons. Now, Brian can’t write, pick up objects or squeeze door handles. Having worked since the age of 14, including putting himself through college, Brian is understandably finding the transition difficult. “I am losing my mind not working,” he said. He spends many of his days going to Journey Forward in Canton, an organization dedicated to bettering the lives of those who have suffered a Spinal Cord Injury through an intense exercise program, and going to Spaulding for his physical therapy appointments. Brian has traded his trusty pickup for a Dodge minivan that can hold his wheelchair and ramp. Brian doesn’t have enough good things to say about Peabody Properties, who manage Capitol Square Apartments, “Peabody is first class—extremely accommodating and detail orientated. Barbara [from the Peabody staff] kept us updated and ensured a smooth transition.” At first, he couldn’t get out of the building because there was no electric automatic door opener. When Brian made the complaint, the opener was installed within the week.